Though, as the princess of pizzazz, the sovereign of sparkle, the flirt of flash, I am obviously loathe to admit it; the time has come to do precisely that. As much as I would love to live out the remainder of my days garbed in anything that gleams, glitters, or glows, even I know when I have been defeated. There is no question about it my loves, the holidays are officially over; therefore, the use of sequins that gleefully wink at the world from their placement about my sweaters or location upon my derriere in the form of shorts reminiscent of a disco ball hanging amidst a barrage of ravers in a nightclub is no longer acceptable. No one, however, said anything about shoes. Christian Louboutin’s Fred Flat Glitter give new meaning to the term “twinkle toes.” Darlings, as if the lace-up oxford aesthetic weren’t covetable enough this season, my beloved Louboutin has gone and upped the ante by allocating the use of dazzling anthracite-hued glitter to make your tiny tootsies feel like seductive showgirls with every step you take. Spiffed up and given a dapper quality courtesy of leather piping; and sporting Louboutin’s signature red leather sole synonymous with the savory decadence of sugar Sweet sunshine’s Sassy Red Velvet Cupcake, Fred has become the new apple of my sparkle adoring eye. 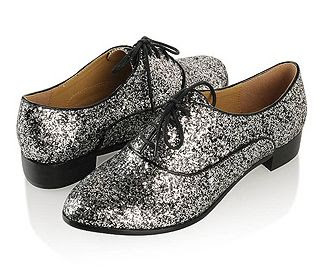 But I digress; while a snarky, tongue in cheek way to allow glitter to live on in your wardrobe year-round, the fabulous Fred harbors a spiteful price tag boasting the digits $595.00 which makes his love completely unattainable. At least for the time being. 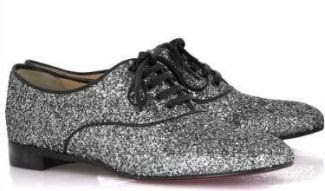 Hence the reason why I am giving Forever 21’s more wallet-friendly Jal-Jacko Glittered Oxfords my undivided attention. It’s true, they lack the Louboutin label, and the scrummy crimson base; but for a mere $20.80 a pair, the Jal-Jacko allows for any girl to add a little glimmer to her shoe collection. And really, there’s nothing as satisfying as that! Thanks to Christian Louboutin Saks and Forever 21 for the pictures. Seriously, F21 has that? I didn't know that or else I have bought one for myself. I fell in love with the Fred Flat Glitter when I saw it in Rumi's feet but I know that I won't be spending that much for a shoes. On a bag, YES! these are crazy cool - seriously! Those shoes are so adorable! I have similar sneakers from Bebe that are COVERED in sequins and surprisingly, I wear them almost everyday! That's a whole lotta sparkle! It's like Dorothy's shoes with a twist! these shoes are so trendy, they will probably be out of style as fast as they came in...so i'd hit up F21 for a pair. no use spending big $$$ on such trendy items. these are amazing... I don't think they're just a trend. I mean, I think paired with a striped top, a fur coat and a pair of jeans they're PERFECT. Amazing find, darling E! I actually like the f21 pair better ~ they seem to have more sparkle! Have you tried them on by chance? I was going to invest in a way more expensive metallic pair, but if the F21 are even slightly comfy I'll go for those! What fabulous shoes! I cannot resist something glittery. :) While having the Christian Louboutin pair would be amazing, I'll have to save my cash and go with Forever 21. Lovely shoes! Great find Erica! Of course, as always, I would go for the cheaper version...ah, maybe one day..
My babies!! I have wanted these for sooo long - I am in awe of F21 - I love them even more now than I thought was possible! omg Erica! I just saw someone on chictopia wearing a pair of these and they are soo cute! I am not sure what I would wear them with yet, but I really like them. I would go for the F21 ones because they look so similar and they are wayyyy more in my budget. I would never think to buy the louboutin version...they're fab and all but i want heel with my loubs. The fred flare are a sweet match too. Nice job! While all the legging styles I'm seeing seem straight out of the 1980s, these glitter shoes seem right out of the 70s glam rock era! Wow! They remind me of these dance shoes I wanted when I was little! Wow, I am so impressed. How do you find these great finds?! I have to say I love anything that sparkles and glitters but I think I like the Christian Louboutin's over F21 on this one. WHAT?! F21 has THAT? Omgoshhh I need to find me a pair of those!!! great find, as usual!! i would have to say F21 in this case since they are so trendy. Ooh this find is absolutely perfect!! I love the glittery Louboutins! They are spectacular. I have to be a big spender this week and go for the Louboutins. I have so many outfits running through my head because of those shoes! I love me a good sparkle! I seriously love those shoes..now those are true dancing shoes to me. All that sparkle! How cool! Awesome finds! Love me some sparkle in my step. I enjoy your blog! Sparkly dancing shoes!Haha I say shoes with glitter all over are perfect for dancing ;) I so wish we have F21 in my country. Oh well. I love these shoes! And your blog- such great posts. Awesome find darling! These shoes would spice up any casual outfit or dress! Ohhhh, sparkly shoes! No one quite does it like Louboutin, but Forever 21 is such a fab option. Great find, girl. It is the kind of shoe that I would wear non-stop. I love glitter. What a great find at Forever 21. Your posts are always inspiring, so I've tagged you in Happy 101 blogger award. Love the shoes! and your blog for that matter. So I've left you an award on my blog. Ummm what a great find! I loved the Loubies but couldn't justify the price. Thank YOU for the cheaper alternative. honestly, i'm not sure how they'd look on ME..but i LOVE LOVE LOVE that style! Both are fun!! Let us know what you decide! Erika, that was so well written, you should actually get paid for promoting those shoes! I do not think that any advert can be compared to your promotion. The shoes are not really something my wife would care to buy, so no matter who makes them or sells them, I will give it a pass. Thanks for leaving a thought on my last post, always love to hear from you. What unique shoes! I would say go with F21 because these are just so trendy you might wear them endlessly for awhile and then tire of it. WOW! that forever21 pair are well worth the value especially for a CL look a like. It's perfectly named for "Fred"
wow, the shoes look so similar, might as well get the F21 version and save $$!! I know I would haha as much as I'd love to be a sassy big spender (one can dream right? ), I certainly can't afford to drop so much money on a pair of oxford flats even if they are Louboutin's and shiny. Wow - these remind me of jazz shoes - so cool! What a great bargain!! Amazing! I really love the shape and style of this shoe. Oh, I fell in love with those Louboutins the first time I saw them in the boutique, but I can't believe how similar the F21s look! Definitely a great bargain and I'd opt for the cheaper version as well. Another great find! I would without a doubt go for the ones from f21, no way I can afford the originals, hehe.. I'm very impressed with F21 lately. Very nice! Man, those are some fantastic shoes. I'd probably have to go with the cheaper ones- the budget just doesn't have any room for Louboutins these days! Now Christian louboutin shoes are very popular!Christian Louboutin is the world’s most famous high-fashion brands. are welcome to contribute comments, but they should be relevant to http://www.uggsbootuk.com ugg boots uk the post.